I work in a unionized office. Major changes are taking place in our industry and our company is going after a large amount of online business. Work assignments, commissions, etc. are all undergoing a revamp. We currently have a group involved in negotiations with management and are trying to work with them so that the workers, the customers and the company all benefit from the changes. Our problem is one of the people on the committee, a person with a great deal of knowledge and experience who unfortunately has personal issues that are compromising her ability to work with anyone. She has a lot of resentment relating to how she perceives she was treated in the past (by management and by the union) and is alienating not only her old friends, but everyone she comes in contact with. She is making negative comments at the bargaining table (about customers, management, co-workers, etc) and constantly bringing up “the way things were” 20+ years ago! She gives off mixed signals about wanting to participate/not wanting to be involved, claims no one respects her, makes no effort to join in with the group and then claims she is being purposely excluded. All of this is stressing out the other team members, making the department look bad to management (one manager noted her behavior and commented on it) and creating concern that she is going to damage our future here. Despite a solid no-layoff clause, she constantly says things like “we probably won’t have jobs a year from now”. Attempts to calm her down and get her to back off have been met with little or no success. She takes all criticism as a personal attack. Serious thought is being given to removing her from the bargaining team. But we will all have to work with her for years to come and we know that she is going to make life even more miserable around here if she is kicked off the team. Do we need to do an AA-style intervention here or what? What else can we do? The negotiation strategy you’re playing right now, whether you like it or not is Good guy/Bad guy. Your overly emotional coworker (we’ll call her Courtney) is the ‘bad guy’. She represents the hard-to-control, hard-to-negotiate faction of unionized workers. Are they a sizable group? You represent the ‘good guy’ workers, the voice of reason who only wants to seek a reasonable and fair solution. Every time Courtney explodes, or stalks off in a fury, you and your team are stepping in to calm down management. I can just imagine the eye-rolling that’s going on, on both sides. You are probably physically cringing as well. Courtney says something outrageous and you collectively pull back in horror at her gaffe and try to smooth over her concerns. Management doesn’t know what to make of Courtney and is looking to you to make some sense of it. Your bargaining team has to analyze whether the Good guy/Bad guy strategy can pay off. If Courtney’s complaints contain a grain of truth, something that union and management has to come to terms with in order to find a win/win solution, then perhaps she is useful. She is voicing complaints that no one else wants to admit — but need to be answered. The problem is that the Good guy/Bad guy negotiating strategy is very divisive and adversarial. It could easily ‘bomb’ and talks could break off. Ideally both sides would be working towards a win/win solution. But that requires talent, finesse and skill. You have to be very clever strategists to show how it is in the company’s best interests to agree to the union’s demands. Your duty is to represent all the members of your union to achieve the best possible outcome. As you say you have no idea what she’s going to say next, and can quickly undermine your best efforts and torpedo your progress. A good bargaining team works in unison and speaks with one voice. Clarity in communications is essential. You can’t be sending mixed messages or you’ll confuse management as to what your real demands are. Agree between yourselves, in private, and then come forward united. But if you don’t remove Courtney, management may question whether you truly represent the whole union, or you are merely the reasonable side. For that reason I would strongly suggest taking her aside and doing an “intervention”. She’s fulfilled her role as the angry disgruntled voice, now it’s time to move on to reach a win/win agreement. 1. The bargaining process is stressful and some people react to stress emotionally. Not everyone is suited to negotiation. 2. The best negotiators keep cool and stay calm. They practice verbal discipline (much like a poker player not showing their cards). 3. You realize that Courtney cares deeply and wants the union to win the best deal. You know she will be devastated if the union loses, or comes off badly in these talks. You know that she only wants the best for the union (whether or not that’s true it is appealing to her higher self to act in the best interests of the union). 4. The bottom line is that it is in Courtney’s best interests (and the unions) for her to step aside and let someone else take over. If all efforts fail to persuade her to ‘do the right thing’ voluntarily you may need to cut Courtney from the team. It’s tough but so are contract talks. Management isn’t going to give you any favors. You owe it the entire union to give it your best shot. If you do decide to keep her on board out of ‘niceness’ and then you end up losing, the union will blame all of you. Are you ready to accept that consequence? 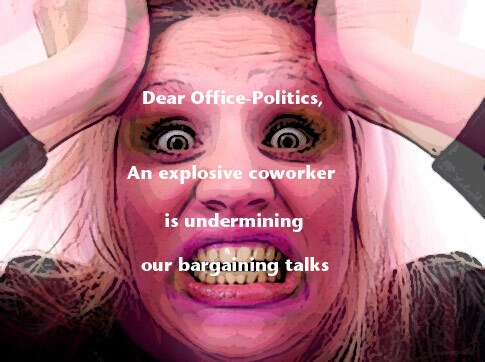 My vote: She is a destructive, divisive element and should be removed from the bargaining team. Thanks for writing to Office-Politics. Let me know how it goes! WOW! Thanks for the quick response. Your reasoning seems very sound to me. I will discuss this with the chief steward. It’s sad when someone can’t see past their personal problems but we can’t let all the hard work we are doing go down the toilet because of one person’s inability to deal. I’ll let you know what happens. Thank you for your advice. I enjoyed reading through other postings on your website and will recommend it to others. The very friendly co-worker gets what ever she wants even though she isn’t qualified.